On February 28, 2014, Chinese State Councilor Yang Jiechi met with Deputy Prime Minister Lodewijk Asscher of the Netherlands in Hague. Yang Jiechi said that since the establishment of the diplomatic relationship between China and the Netherlands 42 years ago, bilateral relations have achieved substantial progress and the cooperation in various fields has yielded fruitful results. The Netherlands has been China's second largest trade partner in the European Union for 11 consecutive years. China appreciated the Netherlands for its positive and enterprising policies towards China. China is willing to strengthen high-level exchanges with the Netherlands, give play to the advantages of all-dimensional connectivity of the two countries, expand practical cooperation, promote people-to-people and cultural exchanges, and strengthen communication and coordination on the promotion of China-Europe relationship, economic and trade cooperation and others so as to push forward the bilateral and China-Europe relations to another new high. The Netherlands has done a lot of effective works for the preparation of the Nuclear Security Summit, and China is willing to work with the Netherlands and all relevant parties to ensure the success of the Summit. Asscher said that the Netherlands-China relations have enjoyed sound development. The Netherlands is looking forward eagerly to the Chinese leader's visit and is willing to comprehensively deepen its cooperation with China in various fields to further enhance the bilateral relations. The Netherlands adheres to trade liberalization and is against trade protectionism. It will make positive contributions to the greater development of Europe-China relations. The Netherlands thanks China for the support for the Netherlands to hold the Nuclear Security Summit and is willing to continue the close communication with China. 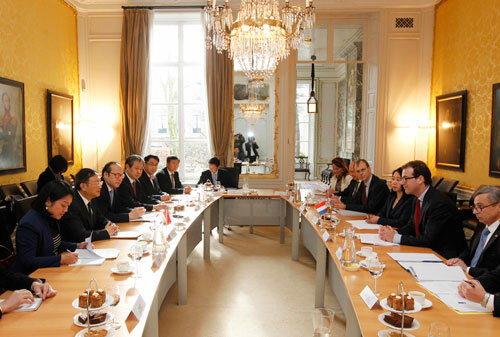 Yang Jiechi met with Foreign Minister Frans Timmermans of the Netherlands the same day.